Media Supply, Inc. has launched its new mobile website for MediaSupply.com, designed to let customers easily research and order blank media and supplies from wherever they are. The site's layout is designed to make MediaSupply.com's most popular product easily accessible from the home page. Our goal with this site was to make it easy for customers to find our popular, large volume products on a mobile device, so they can order quickly while on the go. Media Supply, Inc., a leading supplier of CD and DVD duplication services, supplies and equipment, announced the launch of its new mobile website. The site was designed and built by Unbound Commerce, the leader in mobile commerce solutions for retailers. Media Supply of Exton, Pennsylvania specializes in supplies, equipment and services for data distribution. The new mobile site is designed to make popular products easily to find and easy to order, giving MediaSupply.com customers the convenience of shopping from their mobile devices, any time, any place. Media Supply’s most popular brands of blank storage media, printer consumables and packaging solutions, along with popular 3D printer products, can be found right on the mobile home page. 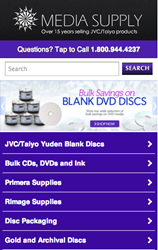 The new mobile site is designed for Media Supply’s loyal customers to order on the go. Musicians who are preparing for a weekend gig can order their blank discs and printer ink while they are in the studio. Church volunteers can place orders for inventory they need, and not have to wait until they get back to their desk. Purchasing managers can replenish their stock levels by ordering from a phone or tablet as they walk through their warehouses. Media Supply, Inc. offers duplication equipment, consumables, services and fulfillment, designed to meet the requirements of those wishing to distribute products and information in data, audio or video form. The company's key products and services are premium blank DVDs, CDs & Blu-ray Disc™, custom USB flash drive, data and audio duplication services, USB duplicators, duplication and duplication supplies. Media Supply is headquartered in Exton, Pennsylvania. For more information, visit their website at http://www.mediasupply.com or call 1.800.944.4237. Unbound Commerce is the leading solution provider for retailers and brands seeking to capitalize on the booming adoption of mobile, tablet and new in-store devices by consumers. Nearly 400 retailers currently use the Mobile Presence® platform for mobile commerce, the leading provider among top 2000 retailers. For additional information, please visit http://www.UnboundCommerce.com.